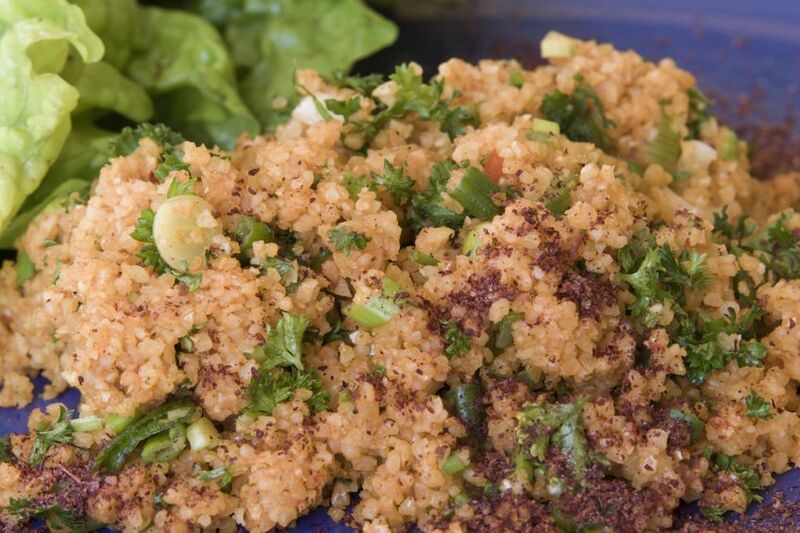 Kisir is just like tabouleh but much spicier. Made with a red pepper paste, it's almost like couscous, but with a kick. Serve with pita, an appetizer, snack, or a small meal. 1. In a bowl, place bulgur wheat along with enough boiling water to cover. Allow to sit for about 15 minutes. 3. Combine red pepper/tomato paste with veggies, herbs and spice. Mix well. 4. Drain bulgur wheat from water and place on towel. Squeeze out excess water. Combine with red pepper paste and mix well. 5. Cover and refrigerate a few hours before serving. Serve with grape leaves, romaine lettuce leaves, and fresh pita bread.